Online food-delivery businesses Just Eat and Deliveroo are serving up beach-themed festivals and virtual dates as they battle for the hearts, minds and stomachs of takeaway customers. Just Eat has established partnerships with restaurant brands, such as Pizza Hut, and worked with agencies, including Synergy, tpf and Verve, on its experiential activity. @JustEatUK has 126,000 Twitter followers, its Facebook page has 1.3 million likes and its Instagram account has more than 10,000 followers. Last February, Just Eat celebrated PizzaExpress joining its home-delivery platform with a Pizza Wall activation, held on National Pizza Day in Bishops Square by London's Spitalfields market. The wall featured 24 pizza-box-styled doors, displaying the logos of Just Eat and PizzaExpress. People taking part lifted the lid of one of the pizza boxes to see if they had won a prize, such as a slice of pizza or a discounted delivery pizza ordered via Just Eat. The brand brought its Food Fest back to London last July, inviting guests to enjoy three days of food and live music. The theme was Desert Island Dishes, which encouraged visitors to think of their ultimate meal. Just Eat helped make that decision easier by serving up some of Britain's most-loved takeaway dishes. The beach-inspired setting gave festival-goers space to relax while they tasted world cuisines, sipped cocktails and enjoyed live music. As part of last year's sponsorship of the X Factor, the Just Eat Jukebox activation used a bespoke touchscreen app to give participants the chance to sing along to the hit songs of previous X Factor contestants. A recording of the experience was captured and packaged into a gif, which was then emailed directly to each fan. This could then be shared on Twitter for the chance to win a pair of tickets to the X Factor final. The jukebox appeared at venues around the UK during the X Factor run. Deliveroo has created experiences in-house and with brands such as Three, as well as working on campaigns with restaurants including Yo! Sushi and Bubbledogs. @Deliveroo has 47,500 Twitter followers, its Facebook page has 660,820 likes and its Instagram account has notched up 38,200 followers. Deliveroo teamed up with Game of Thrones actor Ben Hawkey to open a bakery inspired by the hit HBO drama series. The bakery made its debut on Deliveroo’s app last July to coincide with the launch of Game of Thrones season seven. Fans of the show were able to purchase dire-wolf-shaped loaves, made with wholewheat and orange zest, for £1. In April 2017, Deliveroo partnered Three's rewards app Wuntu to launch a virtual dining experience, called Milan on Thames. It invited Londoners to dine virtually with Italians in Milan and was inspired by the revelation that a quarter of Brits claim to be scared to eat their favourite Italian dish on a date. Guests had the opportunity to enjoy an authentic dinner on London's Southbank while chatting live to their Italian ‘date’. Diners were able to choose a dish from Rossopomodoro’s bespoke menu and enjoy their virtual dinner date as they learned how to master the intricacies of eating 'risky' dishes such as spaghetti. In March, Deliveroo constructed a billboard from burgers near the Old Truman Brewery in east London. Passersby could pick up a beef, chicken or vegetarian burger, made by one of Deliveroo’s restaurant partners. In July, the brand celebrated London Pride by temporarily changing its name to 'Deloveroo' and offering a selection of rainbow-themed dishes in partnership with restaurants. Just Eat’s sponsorship of The X Factor and its related activations have increased awareness of the brand while imbuing it with a sense of fun. 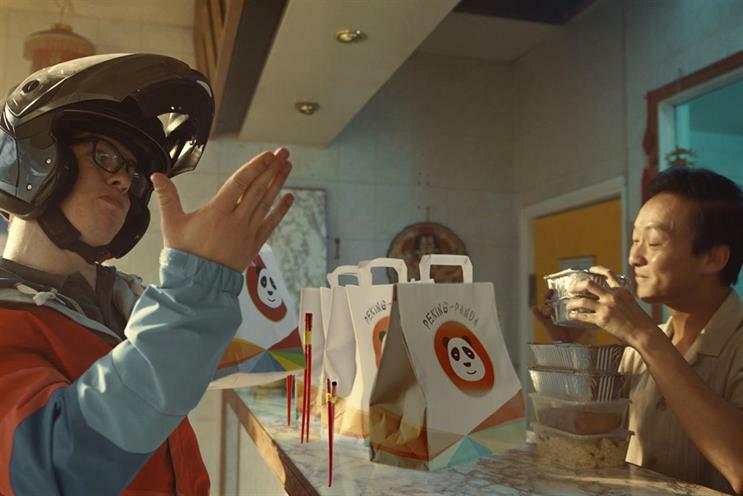 However, Deliveroo’s inventiveness in using virtual reality and attention-grabbing structures has taken its brand a step further and elevated the takeaway concept to a another level.